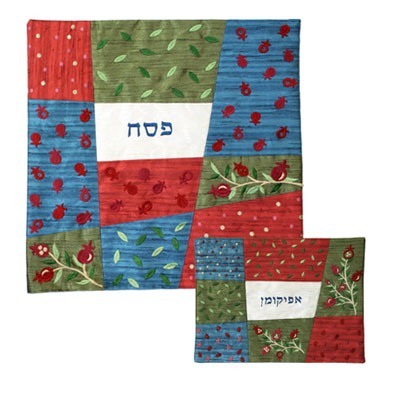 Yair Emanuel's Judaica online store is proud to present our gorgeous collection of Patchwork Matzah and Afikoman Covers with Embroidery. These gorgeous matzah and afikoman covers are a beautiful addition to your Passover table. The covers are made by taking raw silk patches and sewing them together to create a timeless patchwork artpiece. Each silk patch is embroidered with colored thread, and the cover as a whole creates a beautiful effect. Each cover is a collage of blue, red, and green, with maroon pomegranates, branches, seeds, and leaves decorating the frame. In the middle of the covers is embroidered the word “Pesach” and "Afikoman" respectively, in Hebrew, celebrating our liberation from slavery in the land of Egypt. The Matzah cover has three sections inside to separate the three Matzahs. The covers can be bought as a set, but are also sold separately. These beautiful matzah and afikoman covers are the perfect gift for Passover, weddings and house warming. Sizes: Matzah Cover 16" X 16" Afikoman Cover 8" X 12"